Steak can refer to a cut of beef, pork, game or buffalo that is typically served whole as the main course in a meal. Alternatively, you can cut steak up and use it in stews, salads, sandwiches and other meals. 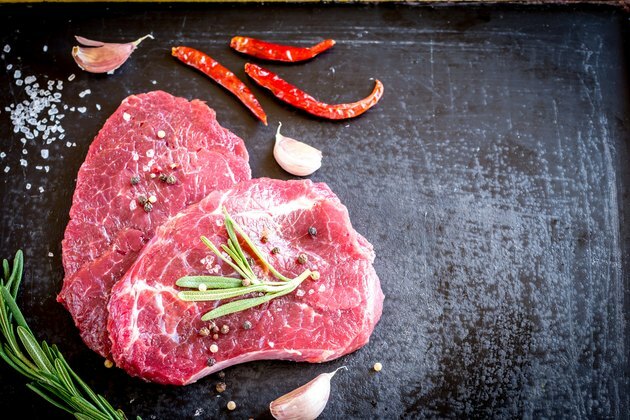 While boiling is a less conventional way to cook steak, it can infuse the meat with flavor and produce evenly cooked meat. Depending on the size of the cut, between 10 and 24 minutes is required to cook a boiled steak. This process is for one beef, pork, game or buffalo steak. Allow the steak to come to room temperature for about 45 minutes. If you want to season the steak, rub your chosen spices or herbs into the meat's exterior before the room temperature rest-period. Salt and pepper will work nicely for most cuts. Place a deep skillet over high heat and add 3 inches of beef stock. Alternatively, you can use a 1:1 mixture of beef stock and water if you are low on stock. Bring the beef stock to a boil in the skillet and add the steak. Place the lid on the skillet and allow the steak to boil for 6 minutes per 1 inch of thickness, per side. When the steak is done, it should register between 125 and 140 degrees Fahrenheit for beef, 145 and 155 degrees Fahrenheit for pork or 160 and 165 degrees Fahrenheit for game or buffalo, depending on your preferred level of doneness. Remove the steak from the skillet and allow it to cool for 10 minutes. Serve or use the boiled steak while hot. Refrigerate leftover steak immediately and consume it within three days. If you are working with a bone-in steak, add 3 minutes per inch of thickness, per side, to the cooking times. Opt for a low-sodium stock to reduce the salt content of the steak.